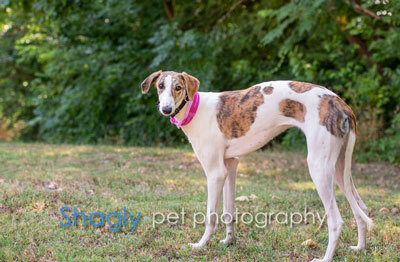 Claire is an approximately 1 year old white and brindle female greyhound that is not tattooed. She was found as a stray by Ft. Worth Animal Care and Control. She is a petite beautiful girl. It is not known at this time if Claire is small animal or cat tolerant. Little Miss Claire is an adorable petite year old sweetheart with the whitest teeth ever! Her markings are exquisite and her floppy ears are positively precious. Don’t let her small stature fool you, she acts and plays just like a big dog. Claire enjoys the company of her greyhound and Havanese housemates – little fuzzy dogs aren’t an issue for her. She loves to run in the yard and while she’ll chase balls, Claire is definitely not a retriever! At first Claire was shy and suspicious of loud noises and is gradually getting more comfortable with the newness of a home. She loves food and is quite the gobbler; not very ladylike! Treats are definitely in her vocabulary. Initially she didn’t respond to her name, and does now, especially when the word “cookie” is mentioned. Claire has become quite the Velcro girl! She is very affectionate and loves to be petted; she just wants to be in the room with you. Claire prefers to sleep in a soft bed near her human and normally sleeps through the night. 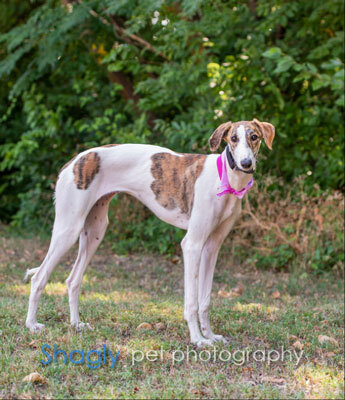 Claire will make a wonderful companion for an active household with a yard and other playful pets.